Large-Scale Scrum (LeSS) is a framework for scaling agile development to multiple teams. With its principles, rules, guides, and experiments it aims to simplify the organizational complexity descales your organization to accomplish more with less. LeSS builds on top of the Scrum principles such as transparency, empiricism, cross-functional self-managing teams and provides a framework for applying that at scale. LeSS.works site offers an overview. It’s simple structural rules guides on how to adopt Scrum in large product development. The Certified LeSS Basics CLB course is a teaser – a brief introduction of the LeSS Framework. It’s a 1-day overview of the LeSS framework and its essential concepts. CLB will help to determine whether LeSS is for you. Why Large-Scale Scrum (LeSS) Framework? The Certified LeSS basics course is for anyone who is involved in a LeSS effort. Developers, Scrum Masters, Product Owners, Agile Coaches, Product Managers, Technical Architects, Program Managers and Delivery Directors in product development groups who are interested in expanding their knowledge of various agile scaling approaches. The main learning goal for CLB participants is to gain more information on what LeSS Framework is, what LeSS is not, the purpose of LeSS and how it may be applicable in their working environment. Participants will learn where to find more information about LeSS and what to do if one is interested in adopting LeSS in their company. 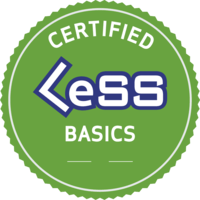 Certified LeSS Basics (CLB) Certification issued by LeSS Company (less.works). The LeSS Basics Certificate will not expire. Each Participant gets an account on Less.works to continue their learning journey. Attendees will also get 8 SEUs / PDUs. 2 Post-workshop group Q&A call for participants. Kamlesh Ravlani is a Scrum and LeSS Trainer, and an Enterprise Agile Coach. Kamlesh has extensive Agile and Lean implementations and transformation experience with large-scale global organizations. He has hands-on experience with large-scale product development, implementing LeSS and helping organizations be Agile at Scale. Kamlesh helps enterprises, leaders and teams significantly improve performance, product development ROI and agility. He coaches senior leaders with strategic + organizational changes and gets hands-on when coaching team members. He brings deep interest towards coaching human behavior and social interactions to create high performing teams. “Our teams in multiple geographies started working as one team. Your teams and the organization will never be same after coaching with Kamlesh.” – A Leader of a Banking client. He brings overall 20+ years of industry experience and playing a variety of roles such as – Product developer, Team Lead, Program Manager, Program Director, Scrum Master, Agile Coach, Enterprise Agile Coach, and Scrum, LeSS Trainer. 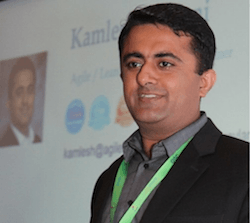 Kamlesh has trained over 1500+ Agile leaders, managers, and team members to apply Scrum, LeSS, Lean, XP, Google Design SPRINT, Kanban, and be Agile. He collaborates with Agile coaches, trainers, and leaders worldwide to build and nurture Agile communities. For LeSS adoption, it is recommended you take the 3-day Certified LeSS Practitioner CLP course. 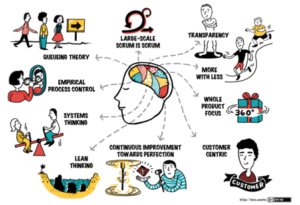 Beyond the LeSS Framework, Organization re-design, systems dynamics, feature teams, requirements areas, LeSS guides, and experiments – the CLP also covers ideas for LeSS Adoption. The CLB is a basics course and focuses on the LeSS Overview. It will not equip the participants to be able to implement LeSS framework.